Light Armored Vehicle or LAV crewmen operate and maintain LAVs and their weapon systems. LAVs are eight-wheeled amphibious armored reconnaissance vehicles that can carry communications equipment. The name of the position is something less than politically correct in this day and age because a LAV crewman can be male or female. 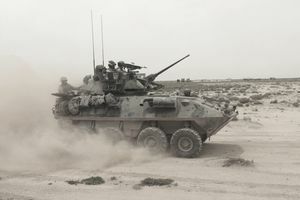 The LAV's role within a larger Marine expeditionary unit or MEU is to conduct security, recon, and screening missions for a larger force along with some independent operations. The military occupational specialty for the job of LAV crewman is MOS 0313. It's considered a primary MOS. LAV crewmen must have gunnery skills to operate the LAV weapons. These include the 25 mm chain gun, the coaxial and pintle-mounted 7.62 mm machine guns, and thermal optics on the LAV-25 variant. They're typically well-trained in security and recon missions as well. Non-commissioned officers can be assigned both as LAV vehicle commanders and LAV 25 gunners. The three-member LAV crew includes the LAV Driver, who maintains the LAV engine and hull components. He or she drives and operates the vehicle and maintains the vehicle as a stable platform from which the gunner can engage targets. The LAV gunner maintains the turret and components of the LAV weaponry and employs its weapons. The LAV commander supervises all maintenance and operations of the LAV, as well as assuming leadership and responsibility for the vehicle and the crew as a whole. An additional four passengers wear combat gear. Recruits who hope to qualify for the job of LAV crewman need a general technical (GT) score of 90 or higher on the Armed Services Vocational Aptitude Battery tests (ASVAB). They must be qualified as a basic infantryman, and they must complete training as riflemen, MOS 0311, at either a school of infantry or the infantry training battalion or ITB. Applicants must also complete the LAV crewman course for assignment as a primary MOS. Marines seeking a MOS lateral or LAT Move to the MOS 0313 are still required to complete ITB training if they have not previously been qualified in an infantry MOS. LAV crewmen must be qualified as at least fourth-class swimmers. The position requires a minimum of 20/200 vision that's correctable to 20/20, and applicants must meet the psychological and physiological qualifications required for licensing as a government motor vehicle operator. LAV crewmen should have a driving record that qualifies them for an SF-46 military driver's license. LAV crewmen must complete the infantry training battalion course after recruit training, followed by the LAV crewman course at Camp Pendleton in Oceanside, California. The ranks of LAV crew members range from private to master gunnery sergeant. The above information is derived from MCBUL 1200, parts 2 and 3. What Exactly Does a U.S. Marine Corps Machine Gunner Do?